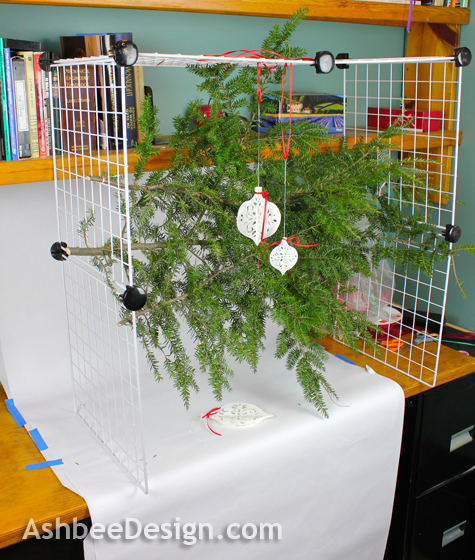 Thought I'd share my set-up for photographing Christmas Ornaments. It is probably unique and shows some nifty repurposing. 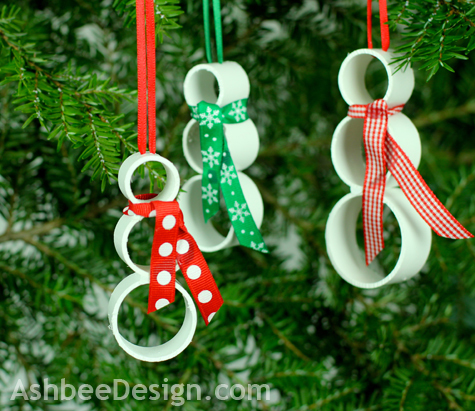 Last year I tried to photograph some of my ornaments both on our tree and on pine trees out-of-doors. Both scenarios were problematic because I couldn't control the background. This year I approached it differently. The idea struck while in the "Swap Shack" at our local transfer station. (Hope your town has one as well. Great for recycling!) Someone had left a set of wire grid snap together shelves. There was a solution for sure. I brought them home and saved them. The girls had tiny private bedrooms and a shared play/work space. Years ago we made them each a desk by placing a finished top across filing cabinets. (This technique has been a favorite of mine for creating very functional desks.) The girls are gone and so the space can be used flexibily. Right know it is my photo studio. 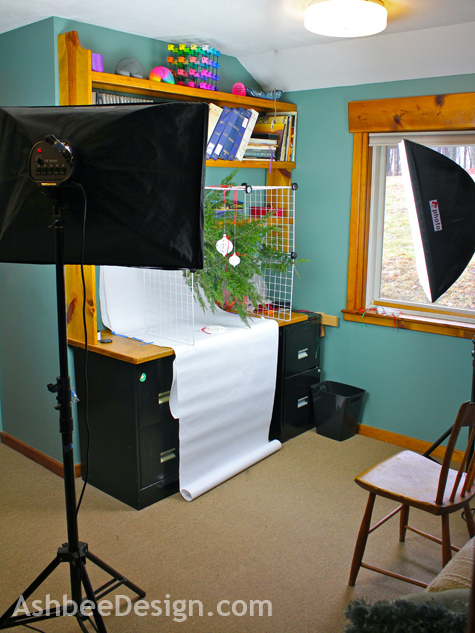 I leave the lights set-up, I have a roll of white paper for a back drop, and for the ornaments, I set-up this shelf system. I left out the shelves and just snapped together the outside frame. 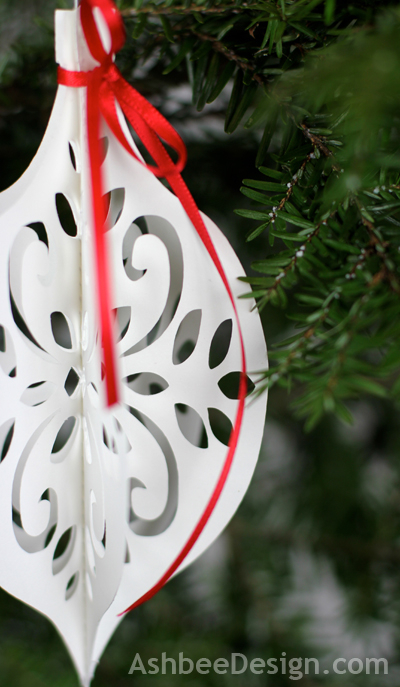 It is lacking structural support but is excellent for simply hanging ornaments. 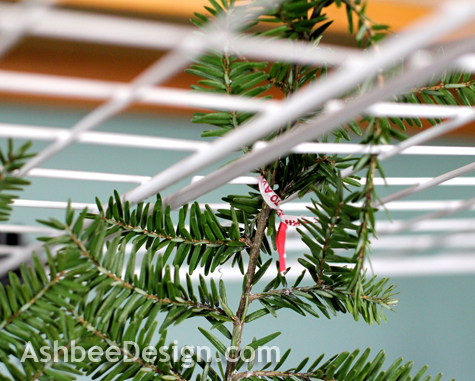 I cut a few hemlock branches and twist-tied them to the grid. This way I could control the branches! And then I suspended my ornaments in front of the branches. It was much easier to arrange them because of the grid in the shelving above. And I didn't have awkward things showing through the branches! Hope this idea helps you with your blog photography. CFL Bulbs • 9 Years? Really!